Rueben Jacob Randle (born May 7, 1991) is an American football wide receiver who is currently a free agent. He was drafted by the New York Giants in the second round of the 2012 NFL draft. He played college football at Louisiana State University (LSU). Randle attended Bastrop High School in Bastrop, Louisiana, where he played both wide receiver and quarterback in his senior year due to the graduation of quarterback Randall Mackey. That year, Randle connected on 166 of 274 passes (60.6 completion percentage) for 2,442 yards and 20 touchdowns, while also rushing for a team-high 680 yards and 12 more scores. His sophomore year, when Bastrop won the state championship, Randle had 14 catches for 433 yards and seven touchdowns. As a junior, Randle had 55 receptions for 1,058 yards and 11 touchdowns, earning him a Class 4A All-Louisiana designation. Randle earned All-American honors by Parade, USA Today, and SuperPrep, and was a participant in the 2009 U.S. Army All-American Bowl. In addition to football, Randle also participated in basketball, baseball and track at Bastrop. As one of the top-rated prospects in the nation, Randle was a consensus five-star prospect by all major recruiting services. Randle was considered a five-star recruit by Rivals.com, as well as the No. 1 wide receiver prospect and the No. 2 overall prospect in the nation. Randle had numerous scholarship offers, but on February 4, 2009 (National Signing Day), he committed to Louisiana State via letter of intent. He also considered Alabama, Oklahoma, Oklahoma State and Miami. — Daniel Montoya, a national recruiting analyst for Rivals.com. Following Louisiana State University's loss in the 2011 National Championship game vs. Alabama, Randle announced his intention to enter the upcoming NFL draft. On April 27, 2012, Randle was drafted by the New York Giants in the 2nd round of the 2012 NFL Draft. 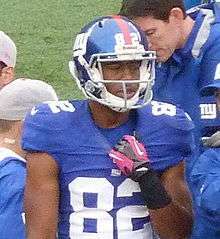 Randle was signed in early May 2012 by the New York Giants. He has totaled 131 receptions for 1847 yards and 12 touchdowns with a 14.1 average in his first three years with the Giants. On March 23, 2016, Randle signed a one-year contract worth roughly $3 million with the Philadelphia Eagles. He was released on August 28. ↑ Wesseling, Chris (March 23, 2016). "Eagles signing former Giants WR Rueben Randle". NFL.com. Retrieved March 24, 2016. ↑ Rosenthal, Gregg (August 28, 2016). "Eagles release Rueben Randle, Chris Givens". NFL.com. Retrieved August 28, 2016.